Opening: Thursday June 12, 2014, at 08:00pm. "I rang the bell, the door opened, I shot, I then said good morning. It wasn't very polite." Remembering Henri Cartier-Bresson, ten years after he passed away in August 2004, Michel Soskine Inc. presents at the gallery space in Madrid an exhibition showing a selection of 21 portraits by this master photographer of the twentieth century. Throughout his entire career Cartier-Bresson captured numerous portraits, often of anonymous people, but also of relevant personalities in the arts and philosophy of his time. Thus, this exhibition features portraits of Giacometti, Lucien Freud, Stravinsky, Jean Genet or Paul Valéry, in a selection that alternates famous images with less known ones. They reflect a time and a context that we can envision very closely, almost intimately, as in the hands of Cartier-Bresson, the camera seems to disappear, as if no one had mediated between the subject and the viewer. Through a fleeting glance or in the privacy of a one-to-one conversation, Cartier-Bresson captures and subtly suggests the personality of those who were prominent figures in the Paris of those years. In 2003, with his wife and daughter, he created the Fondation Henri Cartier-Bresson in Paris for the preservation of his work. 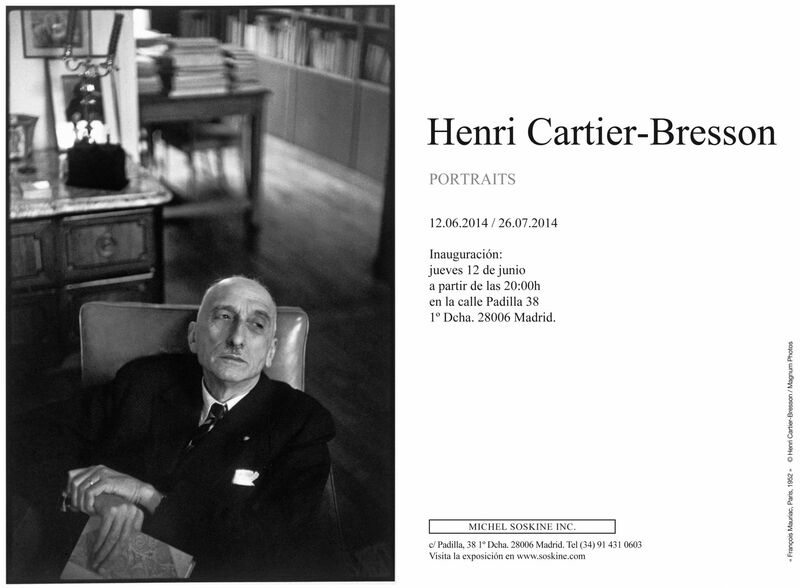 Cartier-Bresson received an extraordinary number of prizes, awards and honorary doctorates. He died at his home in Provence on 3 August 2004, a few weeks short of his 96th birthday.